You will love how simple it is to make your own jam, scroll down to learn how to make Strawberry Jam – both regular and Thermomix instructions are included. Yesterday I braved our local farmer’s markets with all three of our boys (which is no easy task believe me!) and we headed down there early to also have some breakfast – and also as we were all up and ready to start our day at 6am! Although we were originally planning to have a warm croissant for breakfast, the boys instead spied their favourite stall (well, apart from the toys!) and we loaded up on freshly picked strawberries, raspberries and blueberries. We were lucky to score an entire tray of strawberries (around 5kgs) for just $5 and while the boys put a pretty good dent into the tray with their ‘breakfast’ we had HEAPS of strawberries left over when we got home. 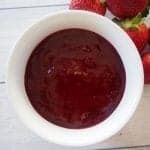 I’ve made strawberry jam with varying success a few times in the past, but decided to combine a couple of different recipes to come up with this easy and practically no fail Strawberry Jam recipe – which has been tested VERY well after making 4 batches of it yesterday! I haven’t used any jam setter in this recipe, instead I like to use a whole apple (don’t remove the skin!) as this also helps the jam to set. The method for this strawberry jam results in a runnier consistency as this is how we like it, however if you do want a thicker strawberry jam, simply cook for longer. If you are looking for more great easy strawberry recipes, you really need to check out this one bowl Strawberry and Banana Loaf, this 3 Ingredient Strawberry Nice Cream or these super cute Strawberry Cupcakes. Steralise your jam jars before you get started. Wash well in hot soapy water and then place into an oven which has been preheated to 100 degrees and let them 'cook' for 15 minutes before carefully sitting aside until needed. Place all of the ingredients for your jam into a large saucepan and cook over a medium heat for 5 minutes - stirring regularly until the strawberries begin to break down. Increase the heat to medium/high until the mixture begins to slowly boil and cook for approximately 15 minutes or until the mixture thickens to the desired consistency and coats the back of a spoon when tested. Allow the jam to cool for 10 minutes in the saucepan (it will also thicken a little more upon standing) before transferring to a blender/food processor and blitzing until the consistency is smooth before transferring to the prepared jars. You can skim any foam which may come to the surface off your jam before blitzing. Make sure you leave the peel on the apples as this is what helps the jam to 'set'. If you would like a thicker jam, simply cook it longer. This recipe can be doubled, your cooking time will increase. Learn how to make this easy Strawberry Jam in your Thermomix! This recipe makes approximately 500ml (2 cups) of Strawberry Jam. Place all of your ingredients into your Thermomix bowl and mix for 5 seconds, speed 5. Scrape down the sides of your Thermomix bowl and cook for 20 minutes, 110 degrees, speed 1. Let your jam cool slightly and then blitz for 8 seconds, speed 8 - make sure your gradually increase the speed and ensure the measuring cup is on. Transfer your strawberry jam to the prepared jars. If you would prefer your jam to be thicker, cook for longer. You can also find more easy family friendly recipes in our ‘Family Dinners Made Easy‘ Recipe Book – also available in a Thermomix edition. Just checking if you used a red or green apple? I have a TM31 what temp should I cook it on?